English students at The Sixth Form College, Solihull have been immersing themselves in the world of Shakespeare this term, with a series of seminars and fieldtrips, culminating in a trip to the Shakespeare Birthplace Trust Centre in Stratford-upon-Avon recently. The students visited the Centre as part of their involvement in the College’s Shakespeare Academy, which is a specialist enrichment offered to very able students with serious ambitions to study English at university. The students enjoyed a two-hour interactive seminar on ‘The Tempest’. The workshop was conducted by Paul Prescott, the Shakespeare Professor at the University of Warwick. 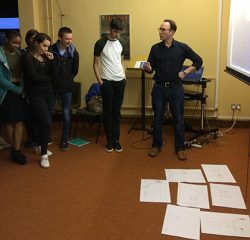 This seminar enabled the students to explore ‘The Tempest’ in more detail. They have previously seen productions of ‘The Tempest’ and ‘King Lear’ at the RSC Riverside Theatre in Stratford-upon-Avon earlier this term. Visits like this are just part of the Shakespeare Academy programme. As well as an association with the University of Warwick, the College also enjoys links with the University of Oxford and Keele University for this project. Before Christmas, the students will have a DVD screening of ‘The Merchant of Venice’ and a seminar at Keele University exploring this text with Doctors Seager and Yearling. After the New Year, a seminar at the University of Oxford will look at all three plays with Chris Salamone and Lucinda Rumsey. The students’ work with the Shakespeare Academy culminates in presentations of their Extended Project Qualifications (EPQs) in the Spring. These projects are pieces of private research and artefacts in response to the 3 plays studied. Past EPs have included sculptures, paintings, creative writing and magazine articles and are rewarded as half an A Level – worth up to 70 UCAS points.